Retail property has had some press coverage of late. It has shown a surprising improvement, given global events and the hike in interest rates. Westfield (a good retail barometer) reported a strong mid-year result from its Australian shopping centres. 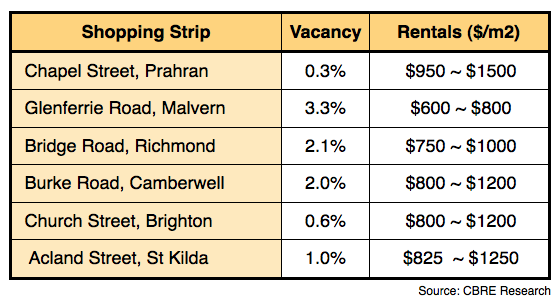 As you can see from the table, Vacancy rates have fallen significantly and Yields firmed — particularly within the strip shopping centres of Melbourne. And furthermore, rentals have also started to climb … as the economic recovery has given shoppers confidence to start spending again. Currently yields ranging between 4% and 6.5% across these various strip centres. And would indicate that investors are returning to retail property once more. 3. Solid rental reviews (CPI or at least 3.75% pa). With these in place, you should be able enjoy a good long-term investment.